Can Dogs Keep Kids from Getting Allergies? July 16, 2018 -- We’ve known for years that dogs, with their floppy ears, slobbery tongues, and faithful dispositions, were good for our mental and physical health. But now scientists believe those health benefits go even deeper. Researchers are examining dog and people germs and finding that bacteria living on and within dogs may be one more way that man’s best friend is guarding human health. Over the past 5 years, many studies have looked at dog ownership, human health, and the human microbiome -- the billions of healthy bacteria that live in and on the body. None of the research is has the final word on the matter, but scientists believe the results say it’s likely that dogs make bacteria in the home and the body more diverse, and therefore help strengthen the immune system. “There is now some confidence that dogs are providing some kind of protective benefit,” says Se Jin Song, a postdoctoral research fellow at the University of San Diego Knight Lab, which is doing one of the largest studies of the human microbiome in the country. Between 500 and 1,000 species of microbes live inside the human gut. Scientists believe they play an important role in the immune system and in keeping the body’s metabolism healthy. Studies also show that the diversity of the types of microbes matter and that a person’s environment can have an impact on that diversity, says John DiBaise, MD, a professor of medicine at the Mayo Clinic in Phoenix, AZ. “The microbiome is affected by internal and external factors,” he says. The fact that Americans spend more than 90% of their time indoors could be a reason why more people have gotten asthma and allergies, scientists say. Without exposure to a diversity of bacteria, the body’s immune system may miss out on a step in learning to differentiate between dangerous and harmless bacteria. This “hygiene” theory has emerged over the past decade, after at least a dozen studies showed that children born into families with significant farm animal exposure had fewer instances of asthma, compared with those that had no exposure to farm animals. Dogs, with their penchant to stick their noses in the dirt, plants, and other dogs, bring a diversity of outside bacteria into the home and may help bodies learn the difference between friendly and unfriendly microbes, says the University of San Diego’s Song. Last year, a Canadian study showed that infants living with either a dog or cat had a more diverse group of microbes in their guts, compared with infants that did not live with a dog or cat. Those with the greater diversity were more likely to have a type of bacteria that appears associated with fewer cases of allergies and obesity. “Pet exposure significantly increased [bacteria] richness” that is associated with healthy infants, and that is missing in less healthy infants, the study authors say. Dogs may also change the makeup of dust bacteria in the home over time, leading to fewer allergies. A study this month funded by the National Institute of Allergy and Infectious Diseases found that the dust was significantly different in homes where a dog had lived for a year, compared with homes without a dog. Another ongoing NIAID-funded asthma study found that 3-month-old children that lived in homes with a lot of certain pet and other dust allergens were associated with a lower chance of getting asthma. 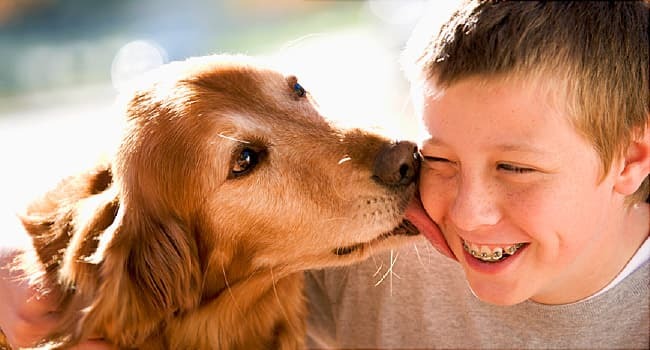 Dogs’ help to the immune system may be strongest in youth. The University of Arizona’s Kelly recently completed a study of older adults, ages 50 to 80, and dog ownership. Her work showed that after 3 months, there was no change in the microbiomes of subjects. She said several studies conducted about a decade ago showed that living on farms may help pregnant women’s growing babies, which has led scientists to theorize that living with a dog can help a baby’s immune system in the womb. For example, a 2009 study in Europe showed that the umbilical cord blood in pregnant women with farm exposure had more active neonatal immune cells. Se Jin Song, postdoctoral research fellow, University of San Diego Knight Lab. John DiBaise, MD, professor of medicine, Mayo Clinic, Phoenix, AZ. Kim Kelly, postdoctoral fellow, Human-Animal Interaction Research Initiative, University of Arizona. James E. Gern, MD, principal investigator, University of Wisconsin Asthma and Allergic Diseases Clinical Research Center; professor of asthma and immunology, University of Wisconsin School of Medicine and Public Health. Are You Allergic to Your Clothes?